Housewife Natalie Ravenna (Shirley Knight) decides that she needs a break from marriage after discovering she is pregnant. She meanders across the United States trying to deal with the notion of being responsible. Along the way she meets a man oddly named Killer (James Caan) with a past he is not ready to reveal. It leads Natalie to ask: should she stay with Killer or return to her husband Vinny? Things are further complicated when Natalie gets involved with a handsome but lonely highway patrolman Gordon (Robert Duvall). The film served as a vehicle for Duvall and Caan, who at the time roomed with each other and were doing a few films together. Later, they and Coppola teamed for the film The Godfather. Roger Ebert of the Chicago Sun-Times gave the film four stars out of four and compared Natalie Ravenna's quest to that of the Peter Fonda character in Easy Rider, and called them both "lineal descendants of the most typical American searcher of them all, Huckleberry Finn." He concluded: "It's difficult to say whether his film is successful or not. That's the beautiful thing about a lot of the new, experimental American directors. They'd rather do interesting things and make provocative observations than try to outflank John Ford on his way to the Great American Movie." According to TVGuide.com, "This odd odyssey was not a hit, even though over the years it has been regarded as one of Coppola's more personal pictures and has attained a limited following." Margarita Landazuri writes on TCM.com: "it has acquired a cult status as an early feminist film for its provocative treatment of a woman seeking her own identity." The work currently has an 82% approval rating on Rotten Tomatoes. In 2015, David Canfield named The Rain People as one of Coppola's five best films, calling it "hypnotic". ^ Gelmis, Joseph (1970). The Film Director as Superstar. Garden City, New York: Doubleday. p. 177. ^ Ebert, Roger (September 19, 1969). "The Rain People". Chicago Sun-Times. Retrieved February 9, 2013. ^ "The Rain People". TV Guide. Retrieved February 9, 2013. ^ Landazuri, Margarita. "The Rain People". TCM. Retrieved February 9, 2013. 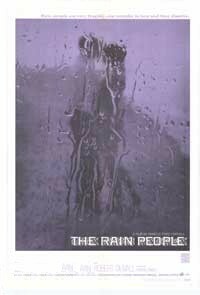 ^ "The Rain People (1969)". Rotten Tomatoes. Retrieved February 2, 2017. ^ Canfield, David (May 21, 2015). "The 5 Best Films of Francis Ford Coppola". IndieWire. Retrieved May 12, 2017.